India POS Terminals Market size was over USD 450 million in 2016 with shipments of over 300 thousand units. The demonetization effect in India and the lack of available cash will propel the India POS terminals market demand as the people in the country are transitioning toward digital modes of payment for goods and services. Demonetization has increased the pace of digital transactions across the country, which has led to an increase in the demand for new machines to provide e-payment facilities to buyers. 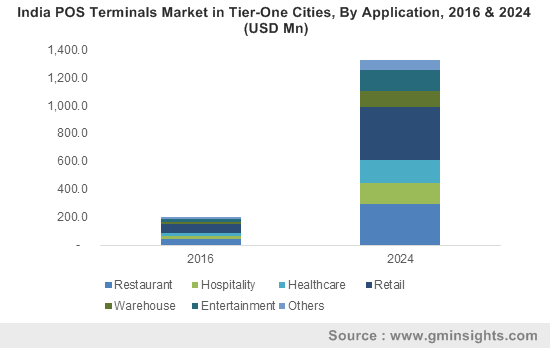 However, there are a comparatively lesser number of POS terminals to meet the demand, which is attracting several players, who will get a strong foothold by offering solutions at the best possible price. Increasing penetration of the organized retail industry in the country and emergence of several e-commerce players offer huge impetus for the India POS terminals market growth. The system helps in streamlining the e-commerce operational platform and enables businesses to sell items online and in-store easily. The POS software used in retail sectors helps in automatically creating customer profiles with every card transaction that is accepted and monitor important customer information and purchase history. India mobile POS terminals market share is anticipated to grow at a CAGR of over 10% owing to the increasing inclination of customers toward mobile wallets, which offer faster and seamless payment options. The portability offered by these platforms further escalates the demand as it enables merchants to accept credit/debit payments through a tablet or a smartphone. In addition, the convenience, mobility, and low-cost advantages offered by mobile systems as compared to fixed systems will contribute to the growth. India POS software market is anticipated to witness a considerable growth over the forecast timeline as it offers several advanced features such as restaurant billing, detailed reporting dashboards, and inventory management. Advanced software solutions help in saving time by automating the tasks such as gathering customer information. The automation allows businesses to make their tasks simpler and streamlined. In addition, real-time or summary information can be retrieved with these devices, augmenting the India POS terminals market growth. India connected POS terminals market will witness a significant growth in the future as it offers integrated value-added services such as couponing and mobile wallets. Moreover, it helps with a high return on investment by improving accuracy, profitability, and sales throughout the business operations. Connected devices are integrated with software applications that enable store owners to manage their total business on the same device they use to accept the payments. The healthcare segment is anticipated to witness a huge demand over the forecast timeline in the India POS terminals market owing to the rising focus on gathering patient’s data tracking activities and the need for streamlining payment practices across healthcare service facilities. Increasing healthcare expenditure and investments, which are directed toward the healthcare infrastructural development will offer opportunities for the segment growth. The system enables the healthcare business to accept payments from online or phone and manage the financial information with advanced reporting options. Increasing number of healthcare facilities accompanied with the evolving payment landscape is expected to contribute to the India POS terminals market size. The rural areas in the India POS terminals market is anticipated to witness a high demand for the system over the forecast timeline owing to the effect of demonetization and rising government focus to facilitate the region with the digital payments technology to cater to the cash-crunch across the economy. To support the digital payments ecosystem and cashless transactions, organizations, such as the National Bank for Agriculture and Rural Development (NABARD), are planning to deploy POS terminals in over one lakh villages, which will also help in offering efficient financial services to the disadvantaged population. Key players in the India POS terminals market include Ingenico, Verifone, and PAX Technology. Several Indian players, such as MSwipe and Ezetap Mobile Solutions, are creating a great buzz in the industry and plan to utilize the huge untapped potential. In 2017, MSwipe announced that it plans to deploy over 50 thousand mPOS devices by the end of 2017. In addition, it also enables them to provide more benefits, such as discounts to the loyal customers, which help them in gaining prominence in the India POS terminals market. The India POS terminals market is supported by various government initiatives to enable cashless transactions in the country. For instance, the Pradhan Mantri Jan-Dhan Yojana (PMJDY) has increased the device sales in the country. The restaurants are progressively adopting the POS terminals, which make use of systems that are integrated to connect POS systems at all locations into a centralized server to ensure smooth business operations. There is an inclination toward mPOS devices in the country, which offers convenient transaction options to the customers attending events or standing in queues.